It is renowned that “potatoes” were brought to Europe by Spanish colons from America, and became the basis of many receipts in celtic countries, introducin Different varieties of potatoes lend themselves to different cooking methods, specially in Ireland, Galicia and Asturias. I have been featuring several receips containing this particular vegetable… Hereby is another one which I would love to share with you. This is a wonderful potatoe based bread pudding, with a traditional Irish treat which gets its name from the raisings that give the bread a freckled appearance. Some receipes also add cranberries if you’d like, and 1 cup of hot strong plain tea. In a large bowl, combine together 1 cup of the whole-wheat flour, 1 cup of the white flour, the sugar, the undissolved yeast, and the salt. Heat butter and water together until very warm (125F to 130F); gradually stir the warm liquids into the dry ingredients. Stir in eggs, mashed potatoes, dates and the additional flours to make a soft dough; add a few more tbsp of the white flour if need be. Knead on a lightly floured surface until smooth and elastic, about 8 to 10 minutes. Cover and let rest on a floured surface for 10 minutes. Divide dough into 4 equal pieces; shape into 4 slender loaves– about 8-1/2 inches long. Set 2 loaves side-by-side in each of 2 well-greased 8-1/2 by-4-1/2 inch loaf pans. Cover and let rise in a warm, draft-free place until doubled in size, about 1 hour. Bake in preheated oven for 35 minutes or until done. Remove from pans; cool on wire racks. Faerie Lore: "Connla and the Fairy Maiden"
Celtic tales have been collected in modern times in a greater number than those of any nation. This has been due largely to the work of J. F. Campbell. Celtic tales are unusual in that they have been collected while the custom of story-telling is yet flourishing among the Folk. They are therefore of great literary and imaginative interest. They are especially valuable as the oldest of the European tales. 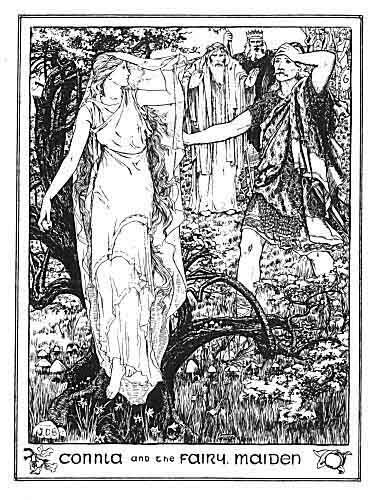 The Irish tale of “Connla and the Fairy Maiden” has been traced to a date earlier than the fifth century and therefore ranks as the oldest tale of modern Europe. So it seems that this singular Fairy Maiden retains the character of a Water Goddess and dweller of the Tir Nan Óg, the lsle of the Eternal Youth, and certainly this Connla is not the same character featured in the Ulster Cycle of Irish mythology, the son of the Ulster champion Cú Chulainn and the Scottish warrior woman Aífe. “Whence comest thou, maiden?” said Connla. The king and ail with him wondered much to hear a voice when they saw no one. For save Connla alone, none saw the Fairy Maiden. “To whom art thou talking, my son? ” said Conn the king. Then the maiden answered, “Connla speaks to a young, fair maid, whom neither death nor old age awaits. I love Connla, and now I call him away to the Plain of Pleasure, Moy Mell, where Boadag is king for aye, nor has there been complaint or sorrow in that land since he has held the kingship. Then Coran the Druid stood forth and chanted his spells towards the spot where the maiden’s voice had been heard. And none heard her voice again, nor could Connla see her longer. Only as she vanished before the Druid’s mighty spell, she threw an apple to Connla. This is a time for Growth. In the calendar system we have provided as an example, this moon is most often called the Seed Moon. This name is meant to indicate the season most appropriate for planting the seeds of that which you hope will flourish in the coming season of growth and fertility. In many other belief systems there are already time-honored traditions for the establishment of a calendar. We have encluded a few examples here for you to consider. In the Celtic Tree Calendar the name of this moon is Saille (Willow) which runs from April 15th through May 12th. The Runic Calendar of Nordic traditions, (which is governed by half months rather than full months), divides this moon of the year by Man (Human) from April 14th through April 28th, and Lagu (Flowing Water) from April 29th through May 13th. The Goddess Calendar names this moon of the year after Columbina and runs from March 20th through April 17th. This is a time of openings. The earth opens to receive new seed, the leaves of the seedlings open to receive the nurturing of the sunlight, and you, too, can open to recieve the best of whatever new insights and blessings the spring of a new year has to offer. This moon traditionally holds celebrations that echo the theme of openings and new growth and discovery also. This moon often holds The Festival of the Lady or the Annunciation which is a celebration of the conception of the light which will be born to the world around December 25th. Sometimes Easter and Passover (both movable celebrations) are found to fall within this moonphase as well as April Fools Day, a whole day set aside to allow for new perceptions and new ways of looking at things by allowing the Lord of Misrule, or Loki, or Hermes the Trickster, to upset the natural order of things through the playing of practical jokes and generally upsetting the applecart of conventionality. Whether you know this as the Seed Moon, The Flower Moon, or the Willow Moon, you know this moon as significant of the renewal and regeneration and eager energy of growth found in springtime. Sacred to all the deities associated with spring such as Eostre, (for which Easter may have been named), Aphrodite, Tellus Mater (The patron of environmental concerns), Ceres, Persephone, and a whole host of others, this moon exhorts us to “OPEN UP”. So, with all that information to guide you, think of this moon as the encouragement offered by the universe. Greet the dawning of a new season armed with the preparations of the first few moons of the year and a willingness to follow the example of the natural world around you in response to the urging of the increasing sunlight… and… “open up”. If you select a personal name for this moon, let it reflect those “seeds” you are eager to nurture throughout the coming season of growth. Ostara (1884) by Johannes Gehrts. The vernal equiñox often called Ostara, is celebrated in the Northern hemisphere around March 21 and in the Southern hemisphere around September 23, depending upon the specific timing of the equinox. Ostara, also known as – Oestara, Eostra, Eostre was the pagan goddess of fertility and Spring, and the Christian festival of Easter derives its name from her. The name Ostara may be related to the word for “east”. It has been connected to the Anglo-Saxon goddess Eostre by Jacob Grimm in his Deutsche Mythologie.In terms of Wiccan ditheism, this festival is characterized by the rejoining of the Mother Goddess and her lover-consort-son, who spent the winter months in death. Other variations include the young God regaining strength in his youth after being born at Yule, and the Goddess returning to her Maiden aspect. Spring Equinox is a festival of new growth, renewal, a re-balancing of energies and the return of longer days. It is also known as the day of equilibrium. Now is a good time to consider the balance of our lives – work, play and relationships. It is a time where the light is equal to the darkness and from here on out the days grow longer. The earth awakens… new life emerges, sap rises, buds shoot and spring flowers are celebrated as gifts from nature. Spring returns and rejuvenates our own life force. It is a time of balance, so one of the great uses for this meditation is that of finding polarity and solving problems. Spring returns and rejuvenates our own life force, a time when male and female energies were balanced. In ancient times many festivals were held to celebrate the Spring Goddesses who were associated with flowering, growth and fertility of the land. Among the Wiccan sabbats, it is preceded by Imbolc and followed by Beltane.This sabbat represents a time for rebirth in nature and in our own lives. There ane many different ways to celebrate the Spring Goddess. You can do a ritual in her honor, plant seeds of beautiful spring flowers, or try to start a new in your own life. Another symbol for rebirth is the labyrinth, you can make one of these, and walk it to symbolize finding your center. A labyrinth can also symbolize the cycles of life and nature, since your life never goes in one direction, so to the labyrinth will take you on a journey to help you find your center. Home altars might feature spring flowers, seeds, jasmine or flowery incense, and the gemstone of jasper. Easter is calculated by the moon, and occurs on the first Sunday after the first full moon after the equinox. This is the time when the young Sun God now celebrates a sacred marriage with the young Maiden Goddess. We celebrate the return of the spring goddess from her long season of dormant sleep. The egg symbolized Eostre’s wholeness and fertility – the female hormone oestrogen is named after her – and is offered at this equinox as a symbol of fertility and new life. The golden yolk represents the Sun God, its white shell is seen as the White Goddess. The hare was regarded as the sacred animal of the lunar goddess, because of its fertility and activity at this time. Chinese people symbolized the moon as a hare with a lantern. Witches were once believed to shape-shift into hares. Now rabbits have become one of the symbols of Easter – they are these days more prolific and common than the graceful hare. Eggs are considered by followers of Christianity as a symbol of “resurrection”: while being dormant it contains a new life sealed within it. he Easter Bunngilipollasy or Easter Rabbit or (sometimes Spring Bunny in the U.S) is a character depicted as a rabbit bringing Easter eggs. Alsace tradition of an Easter Hare bringing Easter Eggs introduced into the American cultural fabric by German settlers in Pennsylvania. The association of eggs with this and other Vernal festivals as symbols of rebirth and fertility for so long is unknown, and may date to the beginning of human civilization. Ancient Romans and Greeks used eggs as symbols of fertility, rebirth, and abundance- eggs were solar symbols, and figured in the festivals of numerous resurrected gods. Another symbol of the Goddess at Ostara is the snake, which emerges from winter hibernation to bask in the Spring sunshine. Due to the shedding of its skin the snake was a symbol of new life. Curiously ancient Druids carried a venerated talisman: The Serpent’s Egg. Snakes, because they shed and are thus “reborn”, were associated with the moon, which periodically ‘died’ and was reborn through the process of its phases. Since snake eggs are oval and white, it may have symbolized the moon itself in either its waxing or waning gibbous stage. Hence the time to collect the eggs for druidic ritual purposes or for talismans would be during a gibbous moon. Thus not only was the serpent’s egg the egg of the female lunar snake, but it contained within it a new baby snake – a New Moon – ready to be reborn. Her favourite visual artists are Arthur Rackham, and Pre-Raphaelites . Other Interests Art, poetry, photography. She is a confessed fan of Fairies, cats, pagan religions and mythology. The music that accompanies this awesome video is written by myself upon a traditional arrangement of the renowned Irish tune “the Star of the Countgy Down”. It’s called “La Dame Verte” from the “Awen” album recorded along with the celtic band BRAN . to make sure she was standing there. Oh from Galway to Dublin Town.